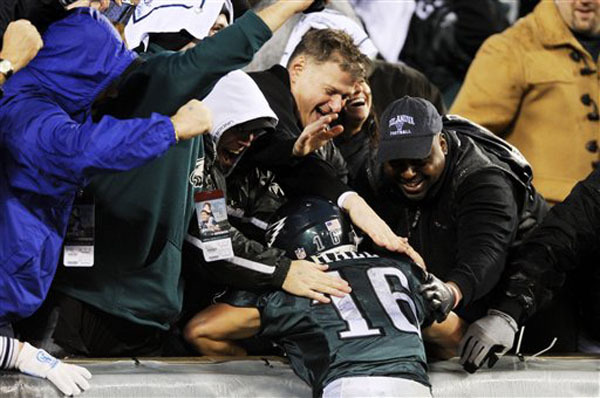 Air Force alum and Philadelphia Eagles wide receiver Chad Hall got so fired up over his touchdown catch in the Eagles regular season finale that he fired up his Twitter account for the first time since Oct. 7. “Playoff week baby! Win or go home!” Hall tweeted on Jan. 4 . While most Eagles starters sat out the team’s last regular season game because the Eagles had already locked up their playoff position, Hall took full advantage. 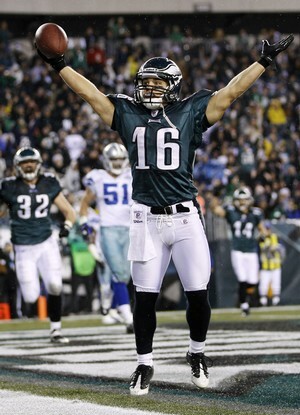 He caught six balls for 84 yards and even took a direct snap at quarterback against the Dallas Cowboys. What might be most important, though, is his punt returns. He returned three punts for 31 yards, including one for 14 yards. This is important because the Eagles put their kick and punt returner on injured reserve after Jorrick Calvin got hurt in the Giants game. Wide receiver DeSean Jackson returns punts in special situations (just ask Tom Coughlin and Matt Dodge) but often had Calvin return punts to protect Jackson from injury. Don’t know if Halls’ three punt returns against the Cowboys earns him some real time Saturday in the Eagles’ playoff game against the Packers, but it sure seems to increase his odds. Despite his size, the Air Force alum who serves as the Eagles’ fifth wide receiver continues to find ways to stay on the Eagles’ active roster and contribute on the field for the NFC East champions.